Luton Town have been drawn at home to Southend United in the Checkatrade Trophy second round. 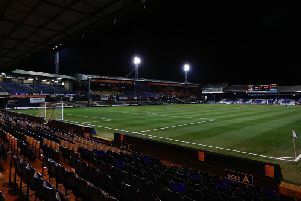 The Hatters finished top of their group stage with two wins and a defeat to ensure a home tie in the competition, while Southend came second in their group, with an identical record. Speaking before Town's opponents were known, boss Nathan Jones, who has already led his side to a 2-0 win over the Shrimpers in League One this season, was relieved to be at Kenilworth Road, saying: "That’s why it’s important to win the group, a home tie is important. "As long as we’re at home, that’s fine by us as we’ve earned that with our first two victories." Full draw, South B: Swansea U21s v Bristol Rovers; Oxford United v Tottenham U21s; Luton Tow v Southend United; Cheltenham Town v Newport County. South Part A: Exeter City v Peterborough United; Cambridge United v Northampton Town; Portsmouth v Arsenal U21s; Chelsea U21s v AFC Wimbledon. North Part B: Barnsley v Man City U21s; Port Vale v Stoke City U21s; Mansfield Town v Bury; Newcastle United v Macclesfield. North Part A: Accrington Stanley v Lincoln City; Rochdale v Oldham Athletic; Sunderland v Notts County; Shrewsbury v Walsall.